A rather bland revenge caper comedy thriller, Tower Heist assembles a large cast and then wastes it on an underdeveloped story. There are moments of fun to be had thanks to the star power on display, but the overall package is a disappointment. In downtown Manhattan, Josh Kovaks (Ben Stiller) is the manager of The Tower, the most prestigious high rise residential address in the city. His crew includes veteran doorman Lester (Stephen Henderson), the tentative desk clerk Charlie (Casey Affleck), housemaid Odessa (Gabourey Sidibe) and rookie elevator operator Enrique (Michael Peña). They all work for General Manager Mr. Simon (Judd Hirsch), looking after every need of the very rich tenants. The most famous and wealthiest resident is billionaire Arthur Shaw (Alan Alda), an investment fund manager who occupies the lavish penthouse, complete with Steve McQueen's bright red Ferrari as a centrepiece decoration. Without warning, Shaw is arrested for stealing $2 billion. Kovaks and his team had all their pension money invested with Shaw, and they lose everything. With FBI agent Claire Denham (Téa Leoni) leading the investigation into Shaw's business dealings, Kovaks assembles his colleagues as well as bankrupt Wall Street investor Mr. Fitzhugh (Matthew Broderick) and common criminal Slide (Eddie Murphy) to plan a daring theft of Shaw's secret safe, located in a wall enclosure within the penthouse. 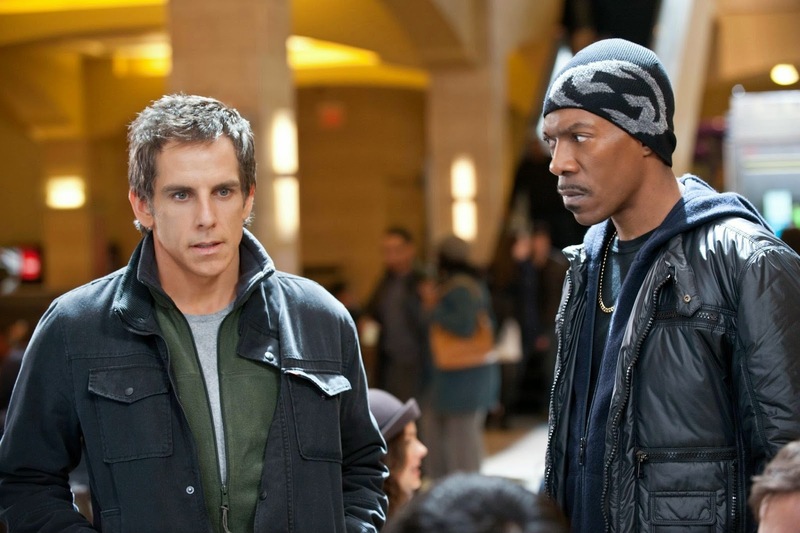 Tower Heist has shiny outside packaging, but a listless core. The film looks slick and sounds great, the bass-and-horns theme courtesy of Christophe Beck packing plenty of promise. The talented array of stars do their part to help make the experience half-way watchable. Stiller throws himself into the role and manufactures a decent level of conviction, while Broderick hits the better comic tones with a brooding turn as an investor chewed up and spit out by Wall Street's merciless carousel. Murphy is in good crude form, recalling the edgy, urban and profane Murphy of old as the one true thief among wannabe crooks, although his scrappy street-level experience is ill-suited to a high-rise heist. Alda (finding his inner Bernie Madoff), Affleck, Peña, Leoni, Sidibe and Hirsch ensure that every corner of the tower is occupied by familiar faces. With most of the budget invested in the cast and the needlessly complicated backdrop of the Thanksgiving parade, little is left for a decent script, and Tower Heist quickly falls apart. The break-in plan is half-baked to the point of emerging from the oven as a sloppy mess, and the attempts at generating some heat between Josh and Claire misfire, although Leoni sparkles in one scene where the FBI agent disappears behind the fog of alcohol and the woman comes to the fore. Once director Brett Ratner moves the action to the execution phase, all the tension gets caught up in that red Ferrari, and the film devolves into a single silly gag, over the top, outside the building and beyond the bounds of reason. Tower Heist gets stuck in the elevator, with great company but going nowhere.